An online platform to unleash the power of grassroots genius. More than 20 years after co-founding YES!, I am launching a new project. So I began wondering: What if the people I met in one city—say, Detroit—could share what they know with people in other communities around the country? What if people had access to the skills that would allow them to step up with confidence together with others where they live? We have a lot of work ahead of us—especially with the retrograde politics in Washington, D.C. Could work in our communities deepen relationships while building our power and nourishing our spirits? Perhaps this is how we can spread the genius of grassroots change. Building a different sort of society happens from the grassroots. By connecting online via Skype, for example, we can keep costs low. And learning groups can develop into the skillful local teams needed to get things done. One more thing. I don’t believe deep change can be top down. I think building a different sort of society happens from the grassroots—most powerfully, when local groups can learn from each other. The response to this idea has been thrilling. People are stepping up to provide and receive training and to help launch this project, which now has a name: PeoplesHub. With this school as my focus, I’ll be limiting my work at YES! to writing columns for the website and the magazine. I believe we need strong communities—to resist the terrible policies of the Trump administration, to sustain us when times get bad (and things could get very bad), and to build the future we want. This isn’t as big a shift as you might think. The careful reader might have noticed that my title changed from “editor-in-chief” to “editor at large” in 2015, when I started my 12,000-mile road trip. 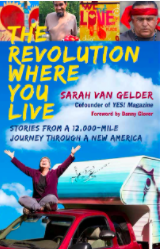 My new status gave me the flexibility to write The Revolution Where You Live, and to go on a book tour in early 2017. And in between, I was able to make two reporting trips to Standing Rock—my reports have appeared here in YES!, in AfterImage: The Journal of Media Arts and Cultural Criticism, and were part of The Spirit of Standing Rock, a documentary produced by Mohawk filmmaker Paulette Moore. I plan to continue branching out with my writing, but my focus will be on launching the online school. I believe we need strong communities—to resist the terrible policies of the Trump administration, to sustain us when times get bad (and things could get very bad), and to build the future we want. Building community takes skills, and I believe we can accelerate learning and empowerment when we unleash the genius we already have in cities and towns around the United States. I will keep you informed as things unfold. The best way to stay in touch, though, is to sign up for the email list at PeoplesHub.org. Looking forward to seeing this develop, and to contributing. Thanks! Next Post PeoplesHub Is Live!